It was a rainy night, a perfect night for spending time with the treadle machine in its new space, the loft area up above the front room of our new Quilt Villa, VA.
It’s weird how you get something all pictured in your mind, how perfect it all would be, until y ou sit to treadle with the machine against the railing and discover that all you can see IS the railing, and not the view beyond the big picture windows at all. Well this won’t work! It simply will not DO! So I made an adjustment. I slid the machine over (Metal wheels can permantently damage the wood floors, so I keep my treadle wheels on furniture sliders) to the top of the stairs and made myself comfy. 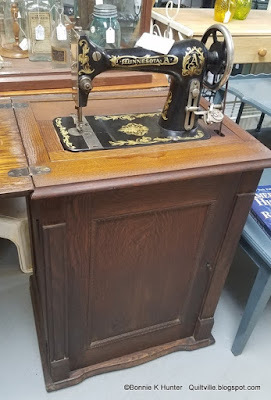 Add a TV tray to hold my bin, an ironing pad and an iron and a couple of standing lamps and I was ready to thread her up and get on down to the business of some easy lazy string piecing. It's been a while since neutral strings have come out to play, and I have a plan! Quipped by Bonnie K. Hunter at 9:20 AM 24 Snips & Comments by others! It’s a well known fact how much I love mountains. Anywhere there are mountains, my soul soars with their heights. I love the farmlands tucked in between the ridges and hollows, fields of green, winding roads and old homesteads, many of which are still occupied and thriving. I love a countryside dotted with silos and old barns. Yes, these two lane highways with double yellow lines generally mean you can’t travel as quickly, and the whole road is a “no passing zone." 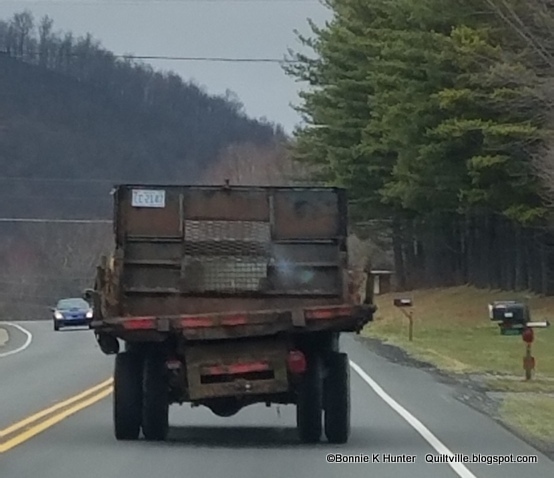 That can cause a bit of a problem of its own if you happen to find yourself following Farmer Jones as he meanders from one spot to another, in no real hurry to get there – This is, after all, Appalachia. Folks drive as slow as they talk down here. Quipped by Bonnie K. Hunter at 9:35 AM 28 Snips & Comments by others! It’s drawing time for our fantabulous March QUILTY BOX! This one is full of such gorgeous fabric, I have already removed the paper wrapper from mine and have thumbed through and petted and have already pulled some of the colors to use in current projects. I LOVE tone-on-tone types of prints and these Sun Print 2017 fabrics by Alison Glass for Andover are marvelous. 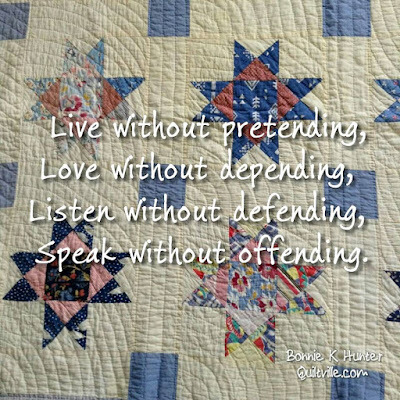 Quipped by Bonnie K. Hunter at 8:01 PM 9 Snips & Comments by others! I could have titled this post NO BIG THING…. But it wasn’t until it was all over, and all was said and done that I stopped worrying about this procedure and how long this uncomfortable process would take. I’ve been living with The Thing on my forehead for the past couple of years. I never thought anything of it. It was just a mole. Not a dark mole, just one of those “age spot” things – until it wasn’t. It started to change shape. It spread. 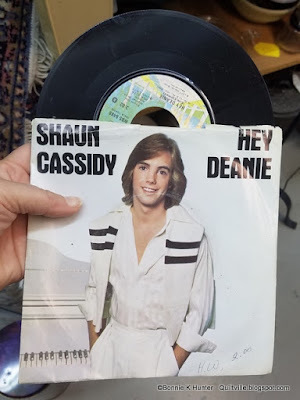 It got shiny edges, and when Doogie Houser pointed it out and said to go have it looked at, I did. Right away. The biopsy was no big deal, but the diagnosis that came in the form of a phone call while boarding a flight to Ohio set me on edge. “It’s a basal cell carcinoma, very slow growing.” said the nurse on the other end of the line. And all I could think was “Get it off! Get it off! Get it off NOW!” Crazy girl, you’ve been living with this for a couple of years, and since the biopsy you have LESS of it now than you did before. Calm down, it will be taken care of. Quipped by Bonnie K. Hunter at 9:39 AM 71 Snips & Comments by others! A Bit of Cabin Stitching Time! This past weekend there were a few moments when I could step away from the unpacking of “stuff’ the hanging on the walls of “stuff” and all of the settling in and simply go through the motion of stitching pieces together with machine and thread. When I sit down to sew, even in the midst of upheaval and chaos – albeit planned upheaval and chaos – my soul finds its happy place. What’s not to love about stitching away with Annie Get Your Gun playing on an old laptop saved for its Cd player capability? This is another one of those reasons that I love having my projects cut out and kitted up so that I don’t have to travel with yardage. Just grab a couple of prepared baggies and sit down and sew. This project has been ongoing for many months now, built as one unit at a time as I found time. There have been times when it has sat idle for a couple of weeks while I was doing other things, but I always came back to it. I've been captivated by i t! Quipped by Bonnie K. Hunter at 7:27 AM 27 Snips & Comments by others! I love rainy days in the mountains when the clouds hang low and hug the ridges. It has always had a “Brigadoon” feeling for me. Misty and magical. Ethereal. Spring rain is so different than rain any other time of the year. It can come gently, it can pound fiercely with the whipping of the wind. It washes the world from the last vestiges of winter, making everything newly green. Such is spring in the Blue Ridge Mountains I love to call home. During our first daytime downpour I discovered some parts of the cabin that I had never seen in action before. We have RAIN CHAINS! Rain chains are a functional and captivating replacement for conventional gutter downspouts. During a rain storm, they turn into a water feature as the rain tumbles from the gutter down the chain, and into a drain in the ground. I could have stood here and watched the rain chaining down for hours. Captivating! But there was a “Run to Lowes” to be made. And I said that I would go, if we could take some detours and explore a bit on our way. And I wanted to go to the antique mall in West Jefferson to see if they had a better cabinet for the “STUFF” I want more hidden. It was a good thing we weren’t in a hurry for anything. I don’t know how this truck was not falling apart on the road! LOL! I love these everywhere I can spot them, and in this area there are many. I have a feeling that there WILL be one on the cabin at some point! This lovely was spotted at the mall! We looked and looked but didn’t find a pie safe type cabinet that I think I want next to the fireplace to hide all the TV related electronic paraphernalia. They had some “made new to look old” stuff –but they were all painted and distressed, and I want WOOD. And I want a real vintage piece, not something new made to look old. I want something beat up with history. That place in Burlington where I found the two dressers – THAT’s where I need to go. And that might happen Wednesday depending on how I feel after Tuesday’s THING removal. There was a lovely Minnesota A in a parlor cabinet. This is for IRENE! LOL! All items needing to come back to the cabin were secured and off we went. I swear, that 25 minute drive gets shorter every time we do it. Parking sign is up! Next to the rain chain. More and more like home every day! I’m headed home today. I’ve got some quilty things to share, but I’ll wait until I’m home to post them from the wifi instead of slow phone data upload. The propane folks will be here Friday morning, so I’ll be back up on Thursday afternoon. I am ever so grateful that my March schedule was an easy one with two weeks off. We have gotten so much done and it couldn’t have been planned better. Did you enter to win our March Quilty Box give away yet? The drawing of our winner happens on Wednesday evening, so be sure to enter on THAT POST. I love Mondays. Mondays give me a clean slate with a full week ahead to live as I want to live. To be a better me. To grab this day by the horns, and show it who's boss! 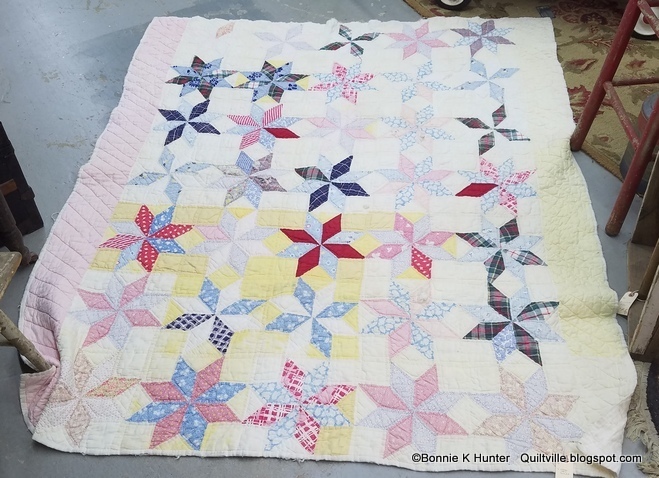 Vintage Ohio star quilt photo sent to me by Cathy in Michigan. Have a vintage quilt you'd like to see used as a Quiltville quote of the day? Email me a close-up photo and I'll be happy to give you a shout out! Make it a magnificent Monday, everyone! Quipped by Bonnie K. Hunter at 9:35 AM 13 Snips & Comments by others! I don’t keep a lot of stash at the cabin. For the most part, projects are kitted up at home – meaning all of the block parts are cut and baggied up and travel back and forth with me from place to place, be it an on-the-road trip where I am sewing during my off hours teaching, and for transport for cabin weekends. My stash fit into a couple of bins, and some of it, like the de-boned shirt parts STAYED in a bin, so into the closet they went along with a bin of crumbs and smaller pieces destined to be used up in very scrappy quilts. The stash cabinet was never very organized, just a set of shelves to place my piles – glass doors have the job of just keeping everything contained and from falling on the floor! Quipped by Bonnie K. Hunter at 10:37 AM 15 Snips & Comments by others! Let’s have a March Quilty Box Gift-Away! March is quickly ebbing by! I love March – I love that the more days in March rounds out the days we were short-sheeted in February. March may roar in like a lion, and go out like a lamb, but I wish it would stay around a little longer. 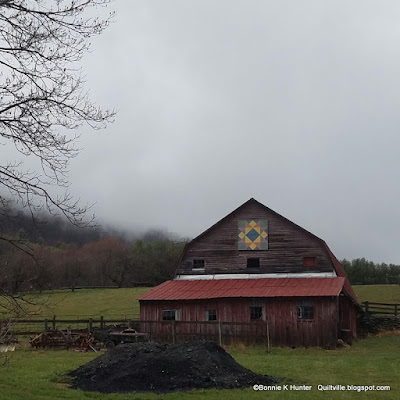 March is full of promises – of spring, or new beginnings, of plans for the summer yet to come, and even new quilting projects just around the bend. I came up to the new cabin on Thursday, and was met by The Hubster yesterday evening back in Wilkesboro for playing yet another round of “load up the trailer!” It’s not as fun as it first was! However, the cabin is now empty of everything that goes IN the new cabin. 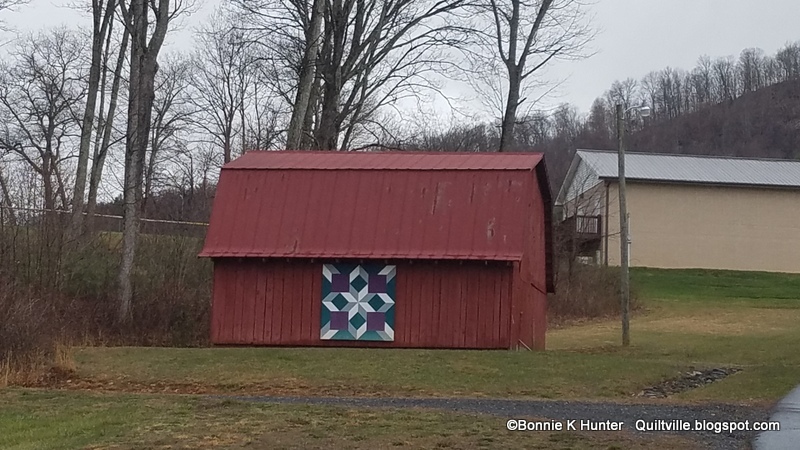 We picked up my stash cabinet, and I can start unloading the stash from the transporting bins and really set up quilt-keeping here in Virginia. Another thing he surprised me with is the March Quilty Box which had arrived while I was gone. It’s an ALISON GLASS box! Oh, yippeeeee! More colors of spring and summer-to-be! Quipped by Bonnie K. Hunter at 9:40 AM 35 Snips & Comments by others! My friend Mary and I had been trying to get together for months now. She lives 30 minutes away, but we can’t ever seem to make it work. It’s crazy how life is sometimes. When she is around and has the time, I’m on the road. When I’m in town – she is on a cruise with her kids, or deep into wedding planning. Life has finally gotten to a place where we are in the same place at the same time and bonus! We could head out for some antiquing and lunch out on the town and talk a blue streak while we catch up on what has been going on in each other’s lives. And while we chatted we wandered! I’ve always loved Mary’s decorating sense. She just “knows what goes!” and it was fun to be on the look out for a certain piece that may work next to the fireplace in the new cabin to hold all of the TV related electronics – DVR, Satellite box, Xbox, whatever other paraphernalia with cords and countless remotes there are. They need a place to be if the TV is going to be mounted on the wall. And I think we found one! Quipped by Bonnie K. Hunter at 9:33 AM 15 Snips & Comments by others! This morning is a re-cap to get it posted up here to the blog, and listed in the archives so you can enjoy it any time you want. I adore seeing what you are up to while we sew together. We had hand quilters, machine piecers, appliquers and groups on retreat all joining in for some evening fun. And no one seemed to mind my “Allergy Voice” Thanks to everything that is blooming here in North Carolina. Oh, how I adore the pink trees – but they don’t adore me! Quipped by Bonnie K. Hunter at 8:16 AM 16 Snips & Comments by others! All of the Quilty Comfort! I find that my first moment of happiness and contentment in the morning is found at the sight of a well made quilt-covered bed. And the one thing that makes a new house feel like a home is choosing which quilt is going on each bed. This one? Or maybe THAT one? One of the things I love about log cabin walls is that I can change the feel of a room just by changing the color theme of the quilt on top of the bed. This is the smaller 3rd bedroom. It’s perfect for a sleep-over when guests come. It fits the queen size metal famed bed, with room for a couple of night stands (Yet to be found, but maybe today!) and has an ample enough closet that the dresser fits inside. On the bed: Florabunda and a miniature block log cabin. Once the bed was together, and clean sheets and quilts were added, this room was DONE! There may be some quilts hung on the walls in the near future, I just haven’t decided which yet. Quipped by Bonnie K. Hunter at 10:22 AM 55 Snips & Comments by others! 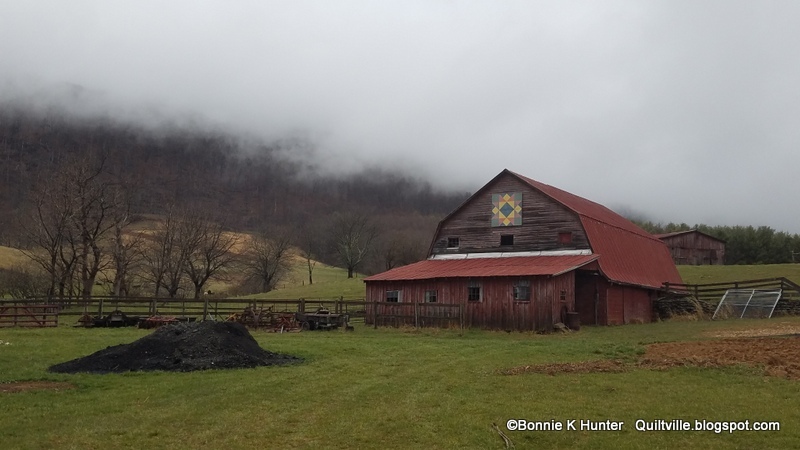 We first crossed the border from North Carolina into Virginia in search of a new cabin location on December 11th. It was cold and windy, and we didn’t take much time to wander the property because we were just beginning our search. Now that the papers are signed and it’s a done-deal, it’s time to get acquainted with this land. I spotted this tree at the far side of the yard – some how I had missed it before, but it made me laugh. This tree is going to need a name. It will come to me. Quipped by Bonnie K. Hunter at 9:29 AM 79 Snips & Comments by others! I took many photos during the course of our moving weekend. And now it’s several days later and I don’t know where to start to post them! That’s the problem of not blogging daily --- there is too much content to then post all in one update. At any rate – good morning! And happy 1st day of spring from Mouth of Wilson, Virginia! I’m attempting to post this using the hotspot on my phone which has a measly 1 bar of cell service and it comes in and goes out, so this post, with just a few photos is a test to see what we can get by with. This first photo is of me, following The Hubster to our closing in West Jefferson, NC. His pickup truck is loaded, the trailer is loaded, and my van is packed to the gills with all the necessary first trip items. Quipped by Bonnie K. Hunter at 9:24 AM 43 Snips & Comments by others! Time to celebrate our love of quilting for International Quilting Day, and whoop it up in a big big way with TheQuiltShow.com! I am happy to be joining hands with Ricky & Alex, Jinny, Gyleen and Eleanor to bring you a plethora of prizes and a weekend of fun. On TheQuiltshow.com website you’ll be finding over 220 episodes with your favorite instructors and designers that you can watch for FREE – ALL WEEKEND LONG! Learn those techniques you’ve been wanting to try. Get a sneek peek into the lives of your favorite folks. And let’s not forget the prizes – Oh yes! THE PRIZES! Quipped by Bonnie K. Hunter at 7:21 AM 39 Snips & Comments by others! Show & Share, Grand Haven Style! Meet my youngest presentation attendee!! Heather braved the weather (okay, I just had to say it that way so that it would rhyme!) to attend my presentation in Grand Haven on Monday evening, with little 2 month old Zelda in tow. They sat in the front row! Right in front of the book signing table. So during a lull in the flurry of activity, I begged for a snuggle. I couldn’t help myself! Baby snuggles are the best, especially when they grunt into your neck, all squishy and warm. And PINK baby snuggles? Oh, the icing on the cake! Zelda is well on her way to becoming a quilter – we are planting the seeds early! Quipped by Bonnie K. Hunter at 9:47 AM 16 Snips & Comments by others! Open Hearts Open Minds Open Doors! How cute are these sisters who sew together? From what I understand, each one AND their mother all decided to dig into our En Provence Mystery without telling the other, and then found they were all doing it! I just love the stories of how relationships are strengthened, problems are worked through, new skills are learned, along with a good solid dose of laughter and good times making memories while we stitch on through the holidays. I just loved this pair in our Scrappy Mountain Majesties workshop in Grand Haven, Michigan yesterday. And getting to spend the day with these ladies was a bonus. Quipped by Bonnie K. Hunter at 7:55 AM 10 Snips & Comments by others! A Chunky Churn Dash Snow Day Sew Day Monday! Time to circle up the Featherweights! 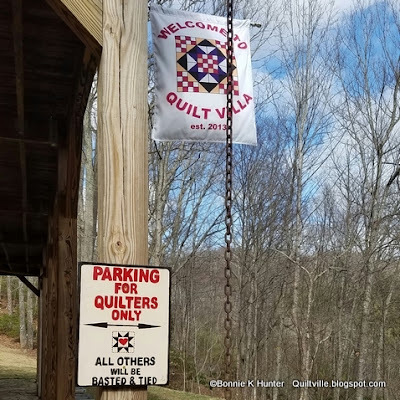 Round them up, quilters –it’s time to show our stuff! They may not have “all” the bells and whistles but these vintage beauties were a number to be reckoned with at our Chunky Churn Dash workshop with the Lighthouse Quilters & Friends in Grand Haven Michigan. Quipped by Bonnie K. Hunter at 8:10 AM 9 Snips & Comments by others! All is Grand in Grand Haven, MI! This was my view as we descended into Detroit yesterday. Blue blue skies, the world starting to turn green. And a huge snow storm on the horizon yet to arrive. It’s March in Michigan. Snow happens. But not on this blue skied sun-shiny day. Not yet. It was SUNday with high emphasis on SUN. But don’t let the sunshine fool you, it was a crisp 27 degrees in Grand Haven when we landed! Quipped by Bonnie K. Hunter at 7:42 AM 25 Snips & Comments by others! Showin’ & Sharin’ Ohio Style! We had a wonderful array of show & share quilts during my time with the Osnaburg Quilt & Fiber Art Guild in Alliance, Ohio this weekend! So many gorgeous quilts made the journey along with those who had traveled in from all over the state of Ohio as well as parts of Pennsylvania, Indiana and beyond. We were all enamored with this gorgeous Celtic Solstice rendition in pink and brown. PINK AND BROWN!! I just love it when a quilter’s vision takes them in their own direction to make the quilt of their dreams. It’s like we are partners in quilt-crime side by side. Isn’t this luscious? Quipped by Bonnie K. Hunter at 9:11 AM 11 Snips & Comments by others! Snowin’ Blowin’ & Sewin’ Away! This was the world outside of my hotel window as I threw open the curtains from my hotel room yesterday morning. It had snowed overnight. It was BEAUTIFUL outside! Cold. Crisp. And I was ever so happy that I packed for this weather. I was prepared! Even the roads remained clear, as they have been warmed by several days of spring weather. This is just the way I like it. Keep the snow on the yards, the fields, the roofs and trees, but keep it off the streets because we have people to see, places to go and are in a hurry to get there. Quipped by Bonnie K. Hunter at 9:41 AM 56 Snips & Comments by others! Sadie made the airport run with us yesterday. You can see how she feels about the whole situation. I’m so sorry, sweet girl! But you know what? I’ll be home next Wednesday, and the days are going to fly as they are so busy – at least on my end. I wound up arriving in Akron/Canton about 3 hours later than expected. This is what happens when I take a later morning flight instead of the first one out of the gate. Flying seems to be just like going to the doctor’s office. If you are the first patient in, you can get in and out no problem and get on with your day. If you take a later appointment – every appointment that came before you that went over time has now pushed you way out of your time slot and things start to domino –- missed second flights because of late first flights. It’s just that being at the airport at 4:30 in the morning is NOT something that anyone loves and looks forward to. Quipped by Bonnie K. Hunter at 7:34 AM 181 Snips & Comments by others! THIS got done in a hurry. And all of the time I thought I was going to have for writing this morning’s post last evening so it would auto-post this morning as I was on my way to the airport went out the window as soon as I saw that email in my inbox. I quickly sent off another email, begging for an extension. It plum slipped my mind. The only issue I’ve ever missed was the 1st one, and I was vowing not to miss this one. I put all else aside, even dinner and hit the design table. I drafted, I pulled colors, and then fabrics, and began to cut. Quipped by Bonnie K. Hunter at 7:33 AM 111 Snips & Comments by others! It DIDN’T happen at ALL yesterday. Yesterday was dermatologist day. Don’t you just love medical updates? I don’t. But it was a first for me. I thought I was going in to have “The Other Thing” just looked at, but before I knew it I was on the table, they were numbing my forehead and slicing The Other Thing off and sending it for biopsy. I was sent out the door with a big band-aid feeling numb from the crown of my head to my eyebrow…maybe even the tip of my nose. But not before the nurse with the most gorgeous red hair and a smiling face sprinkled with freckles and I had a long conversation along with my instruction on “wound care” about the Blue Ridge mountains I love so dearly. Quipped by Bonnie K. Hunter at 8:47 AM 34 Snips & Comments by others! It was a Quilt-Cam evening last night via Facebook Live! And now it is the “morning after” and I’m just getting around to getting this post written so I can embed the video into the post. By the time we were done last night, I just didn’t have it in me to write a night time post, and I figured that everyone else would have likely gone off to other things. And who knows, that might be the way we do it from now on. Because bedtime happens! 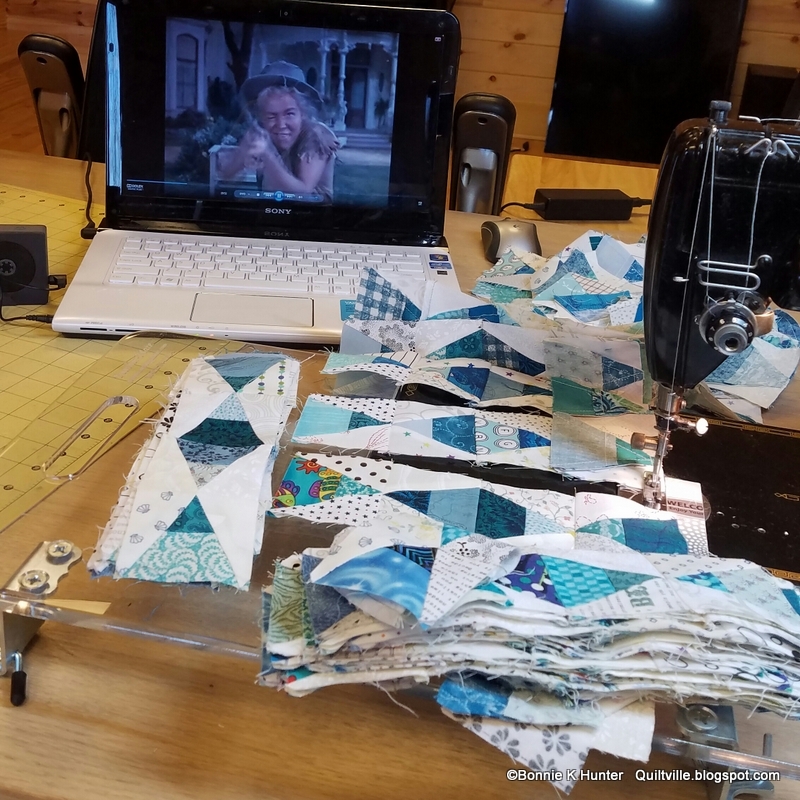 And it was a typical Monday with so many whammies thrown in during Quilt-Cam including blindly going on sewing pieces cut from the wrong colors together….merrily. LOL! And this lead to an impromptu cutting demo as I cut new pieces for the 5 Straits of Mackinac centers that had gone missing somewhere between here and Texas. And we had a great time together! Quipped by Bonnie K. Hunter at 8:45 AM 17 Snips & Comments by others! Emmy Lou, curled up in her favorite spot. She seems to be saying –sometimes you just gotta put the sewing down and spend time with FAMILY! After arriving home on Saturday afternoon and meeting up with Jason and Jenny, not a fabric was pressed nor needle was plied until Sunday EVENING! We talked, we laughed, we watched movies. And other than the guys going out to work on the Honda in the back yard, I don’t think anyone left the house to wander any further than the front porch swing. It was COLD. There was no desire to be outside and with Jason’s hurt shoulder, there wasn’t much that could be done but just rest. I don’t remember a weekend of such LOW productivity coming from me, and that says a lot. It was a weekend to lay low. But that doesn’t mean I wasn’t busy in the kitchen! Last evening was a traditional family dinner, with BOTH of my sons and Jenny at our little table. It was a bit crowdy. But I loved it. The pot roast cooked all day filling the house with yummy smells. Served with mashed potatoes, gravy, braised carrots and a green salad, we filled our bellies full. Cookies came hot out of the oven later. Quipped by Bonnie K. Hunter at 8:34 AM 15 Snips & Comments by others! This is my fun friend Allison! 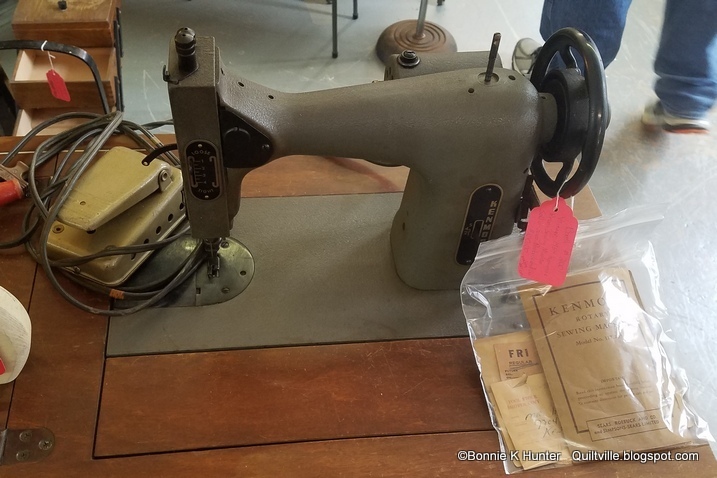 Machine quilter extraordinaire, fixer of vintage treadles and vintage electric machines as well, lover of vintage irons –all things quilty, and APRONS! The comments on yesterday’s post about aprons just struck home to so many, and I loved reading the comments. This morning I found an email from Allison along with her story and I thought I would share a bit about her with you. You might remember her from the post I wrote in mid February about the Singer 99 and the library table that the Minnesota girls pony-expressed down to me. The original library table post from our time in Plano is here, showing Allison in all of her Allison style! And yes, she has STYLE! I love how she brings her love of vintage flair into her daily life, making every moment special, whether it is stopping to make tea during a workshop or the wearing of pearls with her hair up. Allison brings a reminder of the lost "niceties" of life back into every day life. She makes me want to be a better, more refined, more appreciative person. Life is better with doilies, scarves and pearls...and tea! I have had the pleasure of visiting Allison’s home in Plano, even spent a sew day there in between some teaching days, and we had a ball. Aprons were likely amongst the first things made by girls when first learning to sew. I remember my first project in jr high home ec being an apron as well! Allison’s front room/dining room is her long arm studio! I spy a whole collection of Quiltville hanging on railings! I’m very interested in the board with the clippies that Texas Braid is hanging from. What a great way to “hang out” a quilt and let the fold lines and creases release before loading it into the machine. Notice the aprons on the railing? Sounds like you’ve got him well trained! Aprons, vintage irons, doilies and dresser scarf on a vintage ironing board! Right now I’m thinking of all of the hard working hands who have toiled with these irons --who they were pressing for? Was it shirts, skirts, blouses, dresses…and perhaps aprons? This whole post started when Allison mentioned that she was doing machine applique on a vintage Singer with an early blind hem stitch. I just love that these machines are still going strong! This machine is a Singer 223, made in Japan. My 227 is made in Italy. Those Singers got around! A couple of these aprons I inherited when my great aunt passed away. Others were picked up at yard sales, antique mall adventures, or made for me by friends. Most of them are waist-down aprons. Only a few are full-cover. I know what I'm looking for now. But having aprons is not the same as wearing them, and I am VOWING to start doing so. I want to keep my clothes nice. Aprons will help keep the threads off as well as the spatters and spills and the messiness of every day life. The problem will arise when being apron-less when out to town. There is nothing to stop the dribbles when eating out! And with me? Dribbles, spatters and crumbs HAPPEN! I want to play with making some cute aprons out of recycled shirts. I saw these photos floating around Pinterest and I think those would be a fast finish and I’d like to give it a try – the bigger the shirt the better. Aren't these adorable?? This is going to happen. I am going to make some! On the home front – Jason and Jenny arrived yesterday afternoon and we met them for lunch out at our favorite Japanese place. I hadn’t been home since Tuesday, the fridge was bare, so a bit of grocery shopping happened afterwards and we settled in for an afternoon of movie watching, burgers on the grill and just being together. Jason fractured his shoulder during a snowboarding accident in Tahoe last week, so hanging out is about all he is up for and I’m loving getting to just sit and talk without having to go go go. NO SEWING WHATSOEVER happened yesterday! AMAZING! I didn’t feel like pulling out handwork, I just wanted to be with my kids. Breakfast is about to commence. There will be a traditional Sunday dinner late this afternoon with roast beef and all the fixings (APRON ON! I PROMISE!) and we’ll send them back home to Columbia, South Carolina after that as Jenny has work tomorrow morning. It’s been such a nice weekend bonus to have them here. QUILT-CAM!?!? How about TOMORROW evening, Monday, March 6 at 8pm Eastern? It’s been a while since we’ve done one. I leave Thursday for Ohio, so this is our chance! Come look for me in Facebook Live at that time. Afterwards, it will be embedded in a post here in the blog and archived under the Quilt-Cam tab at the top of the blog. Family is not only an important thing, it's everything. Quipped by Bonnie K. Hunter at 9:07 AM 16 Snips & Comments by others! Folding, Packing, Cleaning & Sewing. This is a photo I hope my friend Lynn Provencher from Florida sees. I’ve placed the dolly she gifted to me, made by her sweet mama, at the top of my folded stacks of quilts on the living room couch ready for transport to Virginia. I checked beneath the dolly’s britches. Her mom signed and dated the dolly’s bum back in 1995, around the same time that my own doll pattern business was going hog wild. Oh how I loved those babies, bunnies and bears! Blanche, Lynn’s mom and thus the dolly’s name will be amongst the first treasured items to make the journey across the state line into Virginia when we obtain ownership of our new digs on St Patrick’s Day, March 17th. Blanche reminds me that no matter how old I get, I need to nurture and encourage the little girl who still lives inside of me. Have you said hello to your inner child lately? We need to let them come out and play every now and then. Moving always makes me feel like I’m playing house. And I’m looking forward to playing house in Virginia! Quipped by Bonnie K. Hunter at 9:28 AM 82 Snips & Comments by others! These are the photos I took while dresser shopping on Monday --too many photos to post in one post. Besides, that one WAS about dressers. Now that that job is done, we've got THESE! Machines and quilts. Sigh. I love finding them, I love petting them, examining them ---and mostly leaving them behind as I just really realize (Yes, in the middle of moving!) that you can't OWN everything and you shouldn't want to just because it is for sale and you can afford it. "What are you buying really?" Is a question I have come to ask myself. HISTORY is often an answer, because I love the history of pieces from machines to quilts to sewing notions to vintage dishes, etc. What else are you buying? Ideas. Possibilities. Quipped by Bonnie K. Hunter at 10:06 AM 39 Snips & Comments by others! Of Teacups & Layer Cakes! The packing has begun in earnest. I’ve got the stereo playing my favorite music. I am burning my “nearly gone anyway” favorite jar candle, fragrancing my suroundings – no sense packing it. I’ll burn it until the flame dies, and toss it out as one less thing to pack. I’ll pick a brand new one to light at the new cabin on move-in day. A welcome candle to light our new chapter. Some furnishings are to be left here –a couple of couches, end tables, coffee table, dining room table and chairs. I like knowing that some of my favorite pieces, some that I have acquired while furnishing this place – will also have their spot in the new cabin, and when I visit, they will be there waiting for me like familiar friends with common memories. My word – have I always been this sentimental? Quipped by Bonnie K. Hunter at 9:06 AM 13 Snips & Comments by others! “Guess where I am heading?” I said. 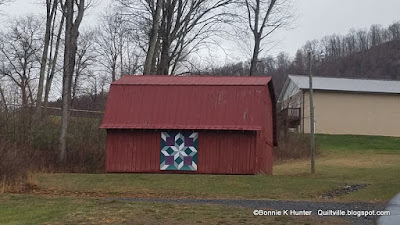 We met in Wilkesboro at a local Chinese place, enjoyed a yummy lunch while talking quilts and cabins and grandkids and sharing photos, and up the mountain we went. Quipped by Bonnie K. Hunter at 8:41 AM 18 Snips & Comments by others!